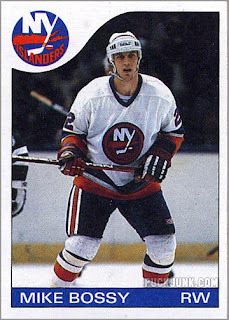 Today we take a look back at the career–in cards–of Hall of Fame right wing Mike Bossy. In 10 seasons, Bossy scored 50 or more goals in all but his last one, which was cut short by injuries. 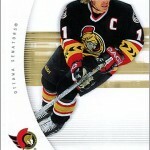 A bad back forced him to retire at age 30.But he accomplished more in 10 seasons that what most players do in 20. 1977-78 – In Bossy’s first year in the league, he scored 53 goals and won the Calder Memorial Trophy as the NHL rookie of the year. No card was issued of him during this season. 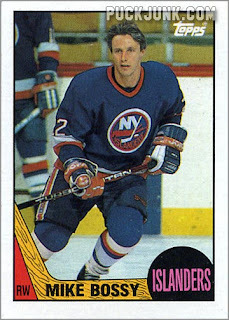 1979-80 Topps #161 (Record Breaker) – In his 3rd season, Bossy scored51 goals. 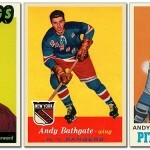 He also scored 23 points (10-13-23) in the playoffs, helping the New York Islanders win their first of four consecutive Stanley Cup Championships. 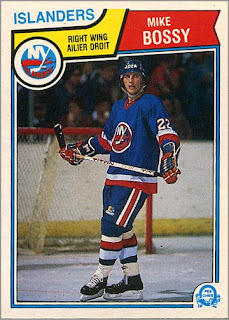 1980-81 O-Pee-Chee Super Photos #12 – This year, Bossy netted 50 goals in 50 games, and 68 goals altogether. 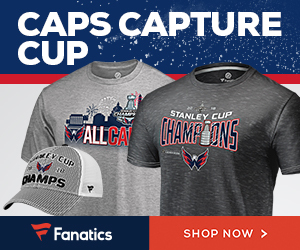 In the playoffs, Bossy scored almost 2 points per game, getting 17 goals and 18 assists in 18 games. 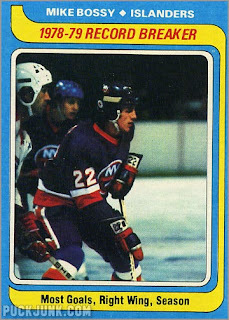 1981-82 Topps #125 East (Super Action) – A nice game-action photo of the Boss-man, who scored 64 goals and 83 assists for a career high of 147 points. 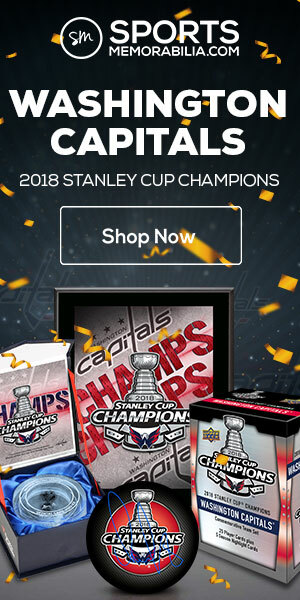 In the playoffs, Bossy won the Conn Smythe Trophy as the Stanley Cup MVP. 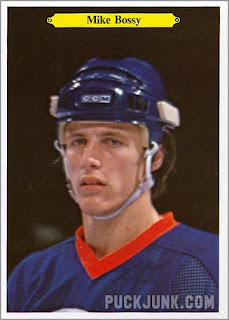 1982-83 O-Pee-Chee #199 – Another season, another 60 goals. Oh, and his first Lady Byng Trophy for being the NHL’s most gentlemanly player. 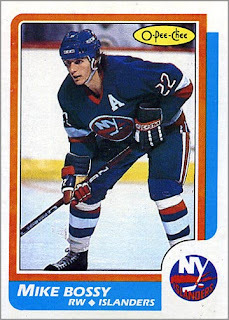 1983-84 O-Pee-Chee #3 – Bossy would net 51 goals and 67 assists in 67 games for a total of 118 points. He’d also win the Byng for a second time in a row. 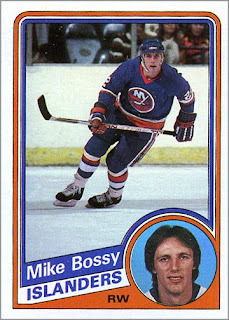 1984-85 Topps #91 – Yet another “over 50” season, Bossy got 58 goals that year. 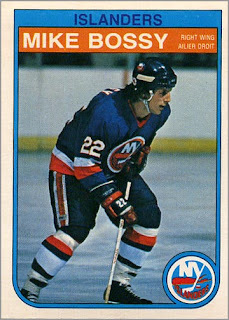 1985-86 Topps #130 – 58 goals for Bossy, who would win his third and final Lady Byng Trophy. 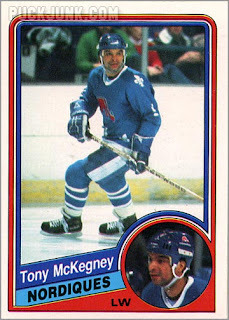 1986-87 O-Pee-Chee #90 – Due to injuries, Bossy played in 63 games.Despite missing 17 games, he’d score 38 goals and 37 assists for a total of 75 points. 1987-88 Topps #105 – Bossy retired at the end of the previous season, so he did not play any games in 1987-88. 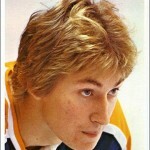 1987 to 1990 – Bossy was a broadcaster for the Quebec Nordiques. 1991 – Bossy was inducted into the Hockey Hall of Fame. 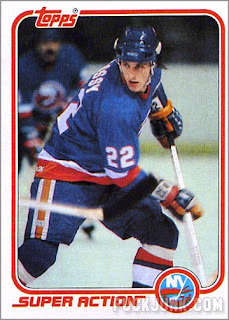 1992 – The New York Islanders retired Bossy’s jersey number 22. 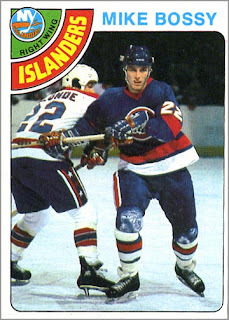 Considering all his accomplishments, it makes you wonder why the Isles waited so long to do this. If back problems had not cut his career short, who knows what else he would have accomplished. 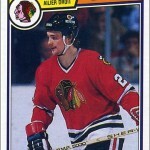 A truly monster of puck, with the net between his eyes….one of my favorites!!!! One of the most under-rated scorers of all time, nice post! I echo shane's comment, there. I remember seeing him play against the Pens back in 85 and telling my Dad that I thought he was the fastest skater on the ice. You are very right with that last comment there. That's also how I feel about Mario. What if? Thanks for sharing your memories, guys. I never saw Bossy play, as I was late to the party and didn't start watching hockey until 1989. Sal – no matter how late you arrive … you can catch up with cards. If Gretzky was # 1 in the 1980's his closest rival was Bossy – a very honorable # 2. I met Bossy for the first time at a Canadian Tire store, he was promoting a auto bio book. There were two people in line, he spent as long as you wanted with him because I guess there wasn’t a big line up. He signed several cards and gave me a free book which he signed. He was super nice to me as a kid (about 12 I think) I remember thinking how much nicer this experience was vs some other nhl’rs I met that same year. again the situation may have been more relaxed. I read his book that first night, I still have the book and I became a big bossy fan after that experience, even though I never saw him play. He retired the year I started to watch hockey in 1987. That’s a cool story, Chris. Thanks for sharing.